Leave your car at home on Monday in honor of World Carfree Day. Tell your friends, family, neighbors, and co–workers to do the same. Check out the World Carfree Day events page to find a gathering in your part of the world. Seattle has an event in Ballard: Get your Undriver License in honor of World Carfree Day. Just pedal, walk or bus it over to the Ballard Neighborhood Service Center, NW 56th St and 22nd Ave NW on Monday, September 22, 2008 from 1-4pm to get your undriver license. 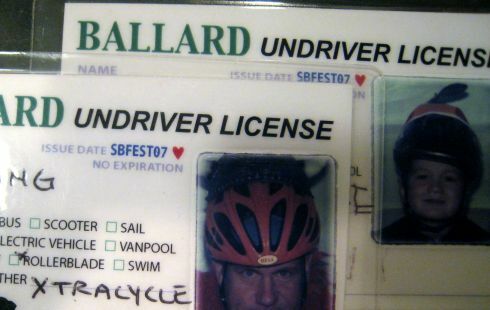 We got Undriver licenses last year at the Sustainable Ballard Festival – hopefully they aren’t expired yet. This entry was posted in alternative transportation, bigger than here, Human Powered Politics, sustainability and tagged alternative transportation, carfreeday, September 22, World Carfree Day. Bookmark the permalink.